From a storm drain, Raph invites the reader down into the sewers to share an important message. Together, the Teenage Mutant Ninja Turtles educate the audience on storm drains; how they indiscriminately carry not just water, but litter directly to the oceans, where the junk will pollute the Earth and maybe even end up on our beaches. Disgusted at the notion, the Turtles explain that there’s plenty they and YOU can do to stop this: don’t litter, recycle, make sure non-recyclable waste ends up in the garbage, etc. After all, we all share the planet and it’s the only one we’ve got! Keep it GREEN! *This mini-comic was originally produced by Mirage Studios, donated to the Santa Monica Bay Restoration Project as part of their 1990 Earth Day outreach program and distributed throughout Los Angeles. *Originally published in black and white, it was colorized (by Barry Grossman) and reprinted in TMNT Meet Archie #1 by Archie Comics. *As a gratuitous public service announcement where the TMNT directly speak to the audience, I’d say this story is strictly “non-canon” for the Archie TMNT Adventures series. I give Stephen Murphy/Dean Clarrain a hard time in these reviews for his eco-preaching, but to be fair, “Storm Drain Savers” was originally published as an honest-to-goodness public service announcement to be distributed toward a cause on Earth Day. 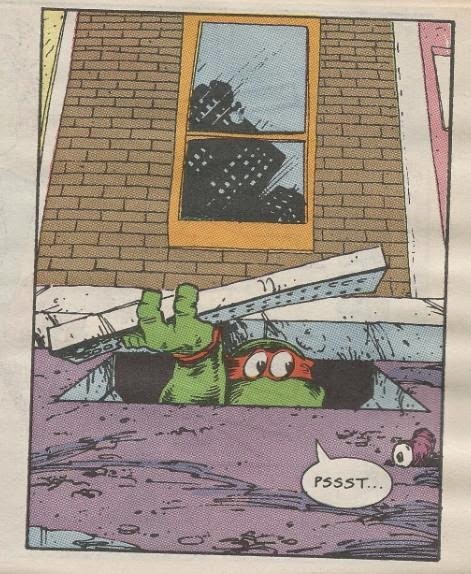 That’s far and away a different thing from the usual stratagem going on in TMNT Adventures, where Murphy attempted to disguise his environmental agenda as a form of entertainment and didn’t exactly succeed at it. Still, that didn’t stop him from finding a way to work this mini-comic into an issue of the Archie series, anyway. Lawson’s art here is actually better than most of his fill-in issues of TMNT Adventures. He goes for a “cuter” style here, with the Turtles being more expressive, less boxy and with greater detailing to the environments. 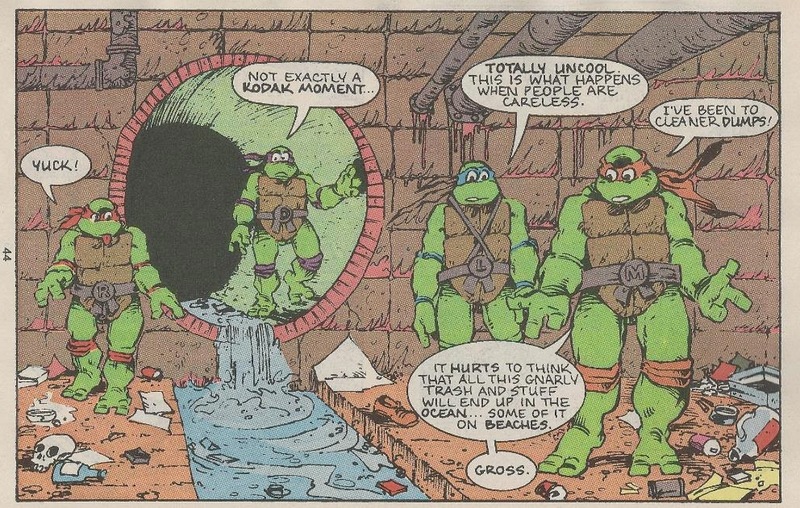 I kinda wish he had put as much effort into his fill-in issues of TMNT Adventures as he did this stupid mini-comic. There’s a five-man inking team on this thing and I gotta wonder what the Hell is up with that, exactly? Did they each ink a page or something? For the colorized version, Barry Grossman actually does something he was very good at avoiding in TMNT Adventures: bandana miscolorings. In the two-page spread, the ends of Leo’s bandana aren’t colored-in, while on the last page, Leo’s and Don’s colors are switched. Like I said, Grossman was typically very good at not making that mistake, so I’ll just assume this was a rush-job of some sort. His colors are otherwise good, as is the inking, and that aforementioned two-page spread is pretty nice. Anyhow, consider this a “free gift” that came with TMNT Meet Archie #1 and not something meant to be genuinely enjoyed. It’s preachy, yeah, but at least it’s honest about it. Lol @ the human skull by Raph's feet! Yikes!